When it comes to the now "typical" Netflix original movie genres, a lot of their releases are either straight up comedies or romantic comedies. I guess it's because it's more approachable and it theoretically can appeal to a wider audience or at least a wider Netflix audience - I'm making some demographic assumptions here. Step It Up is romantic comedy movie that hits a lot of familiar notes but also does a lot to try and distance itself from the "traditional" movie of this genre. But at first glance it's hard to tell the difference since you have the fairly nice protagonists focused on other people and not immediately realizing they're possibly meant to be together. The movie has its share of charm and still follows the general beats of a classic romantic comedy, which is sort of expected in this genre. But even when it tries new things, it still falls back to old habits and feels a little too familiar at times, if you get my drift. Synopsis: Set It Up is an American romantic comedy movie directed by Claire Scanlon for Netflix with a screenplay by Katie Silberman. The movie is a Netflix-exclusive and had pretty positive feedback upon release. Harper (Zoey Dutch) is the personal assistant to Kirsten (Lucy Liu), editor of an online sports conglomerate of sorts. In the same building is Charlie (Glen Powell) is the similarly young assistant to venture capitalist Rick (Taye Diggs). They two encounter one another in the building lobby when both of their late-working bosses ask for dinner and the two are strapped for options. The two eventually get to talking about how challenging it is to work for their very successful but high-strung bosses. This somehow leads to them thinking that in order to create more time for themselves, they need for their bosses to be preoccupied with their personal lives. And thus they come up with a plan to play matchmaker somehow and put the two together. What I Liked: Call me old school, but it was really nice to see the likes of Lucy Liu and Taye Diggs in a movie. Seeing them in one movie together was a bit of a surprise but I guess they wanted to go for the diversity play given the very white protagonists involved. And it's funny that they weren't the lead characters here despite having more star power when you get down to it. So yeah, it was a nice surprise all around. And the bosses are ultimately not totally bad - they're just very driven and have lost sight of things. Well, at least Kirsten is not terrible - Rick is a little less than great, but down with the patriarchy I guess. The writers had a lot of quirky creative moments in their efforts to make this movie feel both familiar yet different and you have to appreciate the work they put into the crafting this story. What Could Have Been Better: That said, a lot of the movie feels very predictable, especially if you have watched any number of romantic comedy movies, and that weakens it a bit. For example, you know from the start that the romance between the bosses is starting based on a lie and of course it's going to blow up in their faces sooner or later. You have the two assistants just trying to make their discrete personal lives work and yes we know there's a greater chance that they're going to get pulled together somehow. For most of the movie both Kirsten and Rick are portrayed in an almost caricature manner, which also weakened the movie. It's hard to root for them since they don't feel real and so much time is invested in depicting how they're being manipulated, which in turn takes time away from actual character development for everyone else. The twist at the end to show that Kirsten has more of a heart than initially presented felt like a little too late. 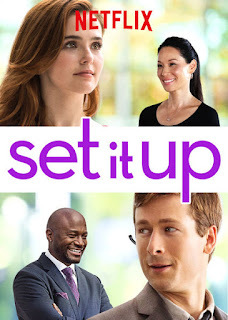 TL;DR: Set It Up is a charming little movie that is largely defined by the classic romantic comedy movie structure and this shaped its narrative one way or another. It's nothing amazing but it's going to make you feel better after watching it for the most part, and isn't that what we want out of a movie like this? Thus it gets a good 4 crazy shenanigans that they organize to bring their bosses closer together out of a possible 5.